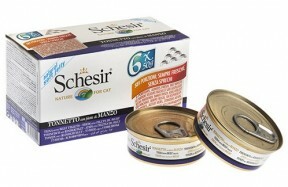 Chicken fillets natural style Top quality food for adult cats made with 100% natural ingredients, f..
With tuna, chicken fillets and rice natural style Top quality food for adult cats made with 100% na..
Tuna with Chicken fillets Top quality food for adult cats made with 100% natural ingredients, free ..
Chicken fillets with shrimps Top quality food for adult cats made with 100% natural ingredients, fr..
Chicken fillets with Apple All the quality of Schesir 100% natural ingredients in an original and d..
Chicken fillets with Pineapple All the quality of Schesir 100% natural ingredients in an original a..
Chicken fillets Top quality food for adult cats made with 100% natural ingredients, free from added..
Tuna natural style Top quality food for adult cats made with 100% natural ingredients, free from ad..
Tuna with Quinoa Top quality food for adult cats made with 100% natural ingredients, free from adde..
Tuna with Shrimps Top quality food for adult cats made with 100% natural ingredients, free from add..
Tuna with Surimi Top quality food for adult cats made with 100% natural ingredients, free from adde..
Tuna with Kiwi All the quality of Schesir 100% natural ingredients in an original and delicious rec..
Tuna with Mango All the quality of Schesir 100% natural ingredients in an original and delicious re..
Tuna with papaya All the quality of Schesir 100% natural ingredients in an original and delicious r..
Tuna with Seabream in natural gravy Top quality food for adult cats in natural gravy, enriched with..
Chicken fillets with pumkpkin Schesir quality, with 100% natural ingredients, is also in multipack ..
Chicken fillets Schesir quality, with 100% natural ingredients, is also in multipack format, each w..
Chicken fillets with aloe KITTEN Top quality food for kitten in the convenience format 140g can: ca..
Chicken fillets with duck Schesir quality, with 100% natural ingredients, is also in multipack form..
Chicken fillets with rice Top quality food for adult cats in the convenience format 140g can: caref.. 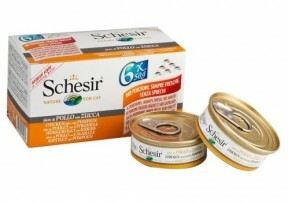 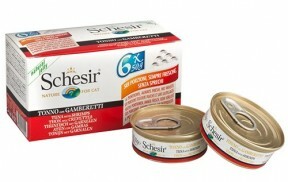 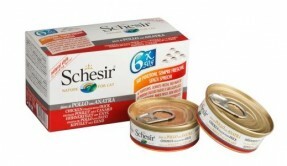 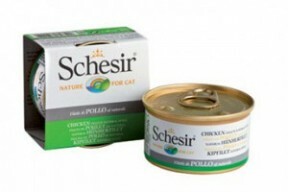 Maintenance with Fish Schesir Dry Line is prepared with natural ingredients* with the addition of v..
Sterilized & Light with Chicken Schesir Dry Line is prepared with natural ingredients* with the.. 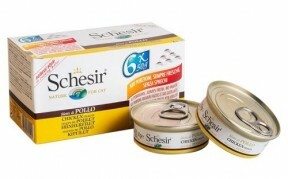 Maintenance with Chicken Schesir Dry Line is prepared with natural ingredients* with the addition o..
Hairball with Chicken Schesir Dry Line is prepared with natural ingredients* with the addition of v..
Kitten with Chicken Schesir Dry Line is prepared with natural ingredients* with the addition of vit..
Chicken fillets KITTEN Top quality food for kittens is soft jelly: with 100% natural ingredients, f..
Chicken fillets with Hake Top quality food for adult cats in soft jelly: with 100% natural ingredie..
Chicken thin slices in gravy Top quality food for adult cats in natural gravy, enriched with tapioc..
Chicken with Mullet Top quality food for adult cats made with 100% natural ingredients, free from a..
Tuna and chicken with shrimps Top quality food for adult cats in soft jelly: with 100% natural ingr..
Tuna Top quality food for adult cats in soft jelly: with 100% natural ingredients, free from added ..
Tuna with chicken fillets Top quality food for adult cats in soft jelly: with 100% natural ingredie..
Tuna with Pilchards Top quality food for adult cats made with 100% natural ingredients, free from a..
Tuna with Seabream Top quality food for adult cats made with 100% natural ingredients, free from ad..
Tuna with beef fillets Top quality food for adult cats in the convenience format 140g can: careful ..
Tuna with beef fillets Schesir quality, with 100% natural ingredients, is also in multipack format,..
Tuna with shrimps Schesir quality, with 100% natural ingredients, is also in multipack format, each..